Not great conditions for today either. 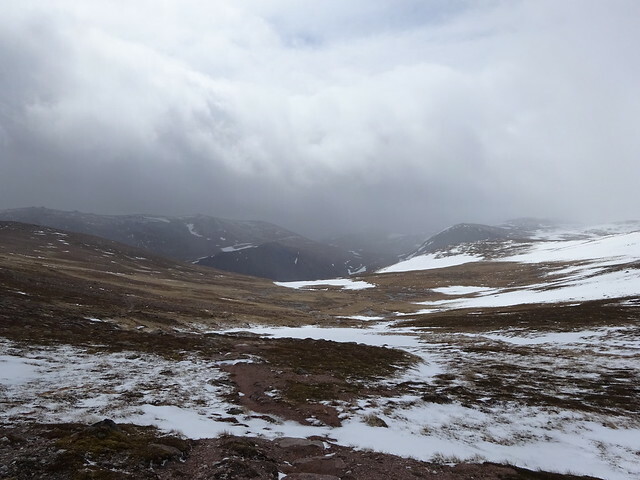 Headline for the Cairngorms NP was rain/snow and upland gales. 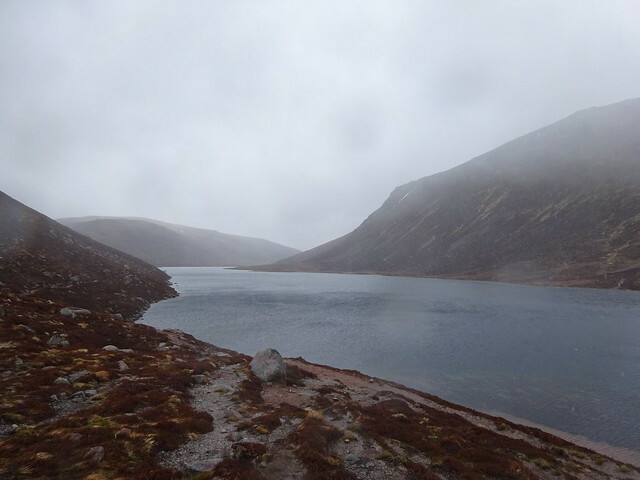 I was at the wrong end of the Cairngorms anyway to do the walk I had originally planned. 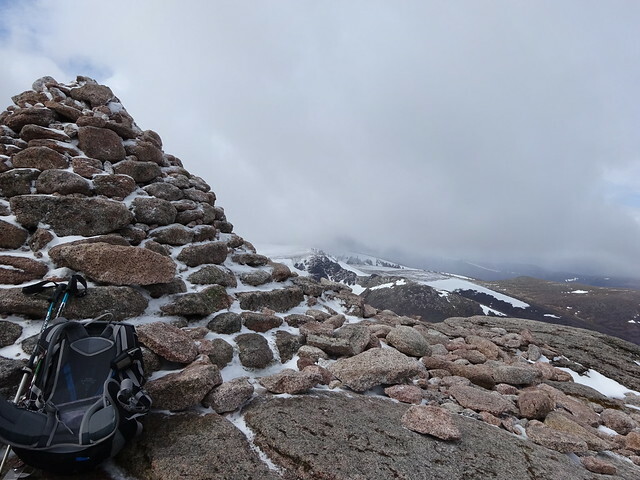 So plan B was inevitable, which consisted of Cairn Gorm and maybe Beinn Mheadhoin, but I was fairly non-committal about the latter. From the ski centre I followed the path at the back of the building up Sron an Aonaich, which is signed as the Windy Ridge route, a very apt name. The path is excellent but it is quite a sustained pull uphill. 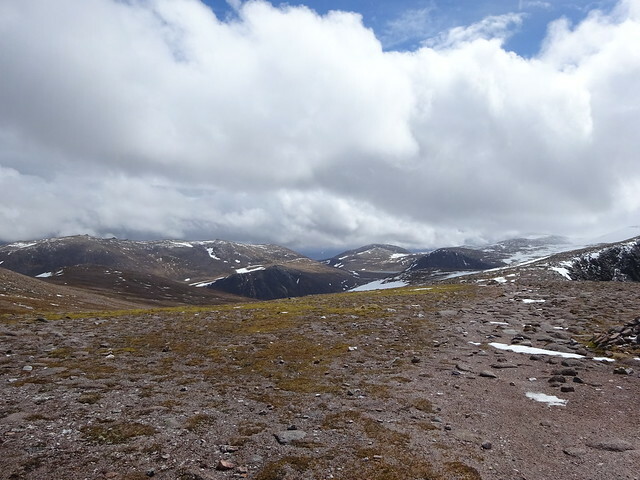 From the Ptarmigan restaurant I continued SE and then N. Initially the path was easy to follow, but it was soon lost in the patchy snow. Low cloud drifted in and out carrying a flurry of snow. 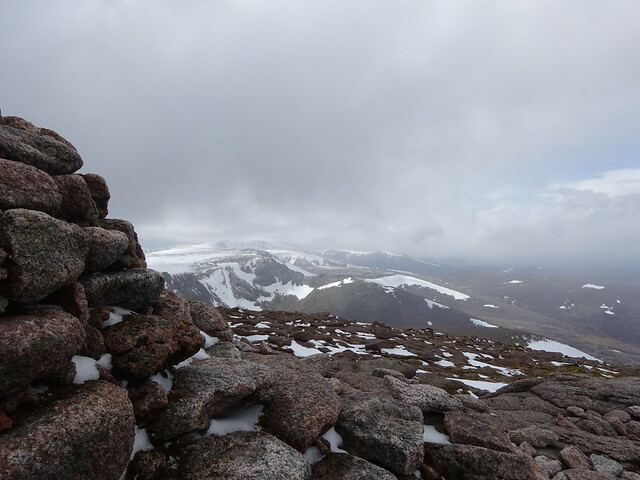 There were occasional views to A’ Choinneach and Bynack More. The weather station loomed up and the summit was reached shortly afterwards. It was very windy and cold. 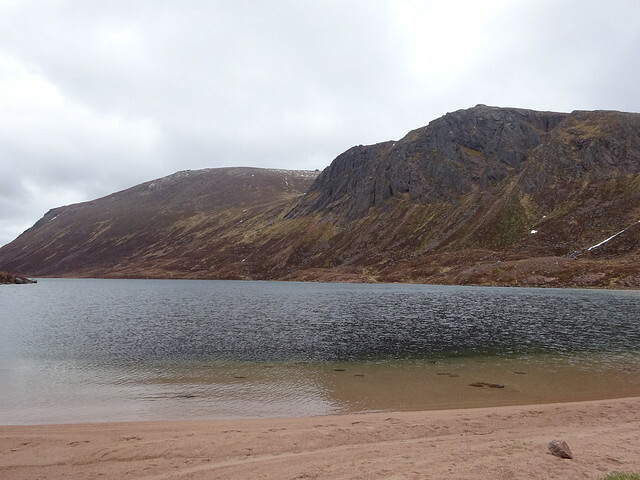 Coire an t-Sneachda looked magnificent. 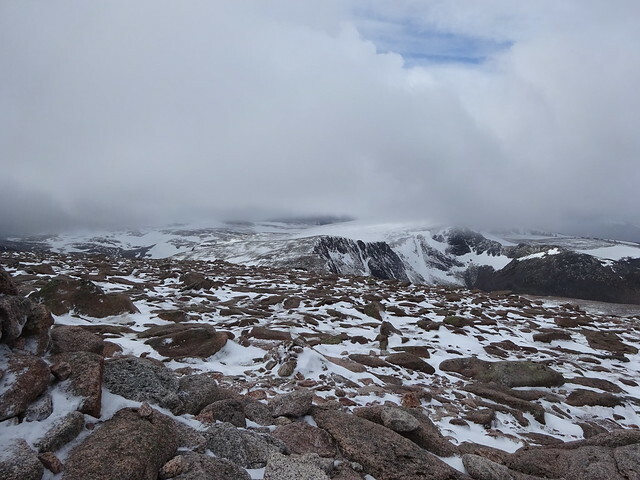 It was too early in the day to turn back, so I decided to check out the snow field at the head of Coire Raibert. Again it was difficult to spot a path on the descent, with the boulders and patchy snow. But once down a great path led on. 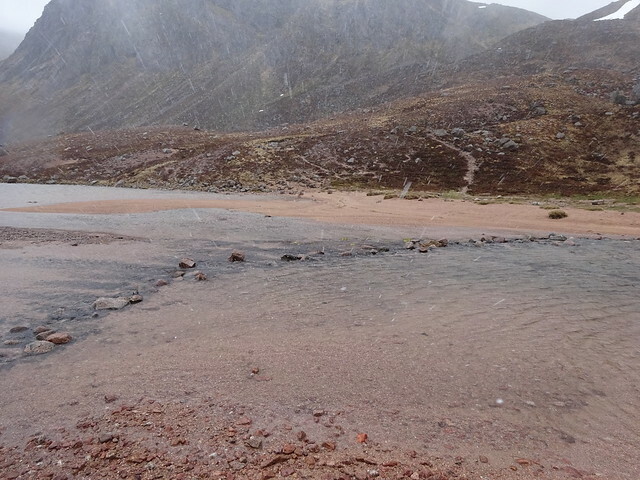 It appeared that the snow was mostly on the west side of the corrie. Great, let’s check out what’s further down then! Steep, rough, loose, wet and slippery were the attributes I had read about this descent, but it wasn’t that bad at all. Much faster than expected I arrived at the shores of Loch Avon. What a place, very secluded, almost a different world. I couldn’t turn back here, I just had to continue. The path along the shore does require care and attention, it is very rough and bouldery. But that was all forgotten when I got to the head of the loch. A sandy beach, calm water. How lovely even on a dreary day like today! 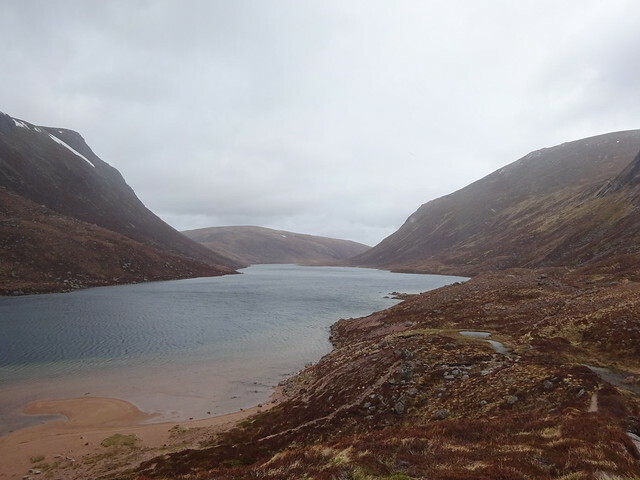 As I skirted around the loch I spotted a ford, crossing the Feith Buidhe in two stages. The water was low so there was no need to investigate any crossings further upstream. 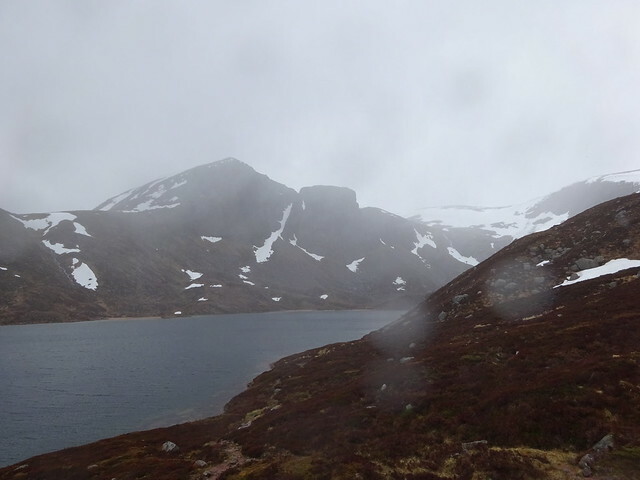 Once across there were even better views of the loch and the weather had perked up as well. Hmm, Beinn Mheadhoin might still be on the cards. As I walked westwards, I could see the slanting path heading up. It all looked very doable. Where the path turns sharply eastwards I continued straight ahead in search of the shelter stone, curious what it would look like. And there it was. I saw the ‘outbuilding’ first. Less sheltered, but also less claustrophobic. I left the sheet of yellow plastic where it was, it might come in useful for someone in need. Further to the right was the entrance to the main shelter. It was very low and narrow and I could only just make out the space behind it, clearly offering a very effective shelter. However the thought of creeping under such a massive rock didn’t appeal so I didn’t explore further. The conditions were obviously not dire enough! As it was just past noon some seating outside was perfect for lunch. I watched the weather above Beinn Mheadhoin come and go as I ate my sandwiches. Snow, clearing, snow, clearing…. It didn’t look far at all. But I was very aware that this was a sheltered spot and that conditions higher up would be much less favourable. Also, in the snow showers the hills had disappeared completely and navigating in a white out was not on my bucket list. I sat there for a while just marveling at the beauty of the surroundings. I made my way back at a very leisurely pace. This was such an amazing place, I had rather not left at all. On the walk out various snow showers passed. 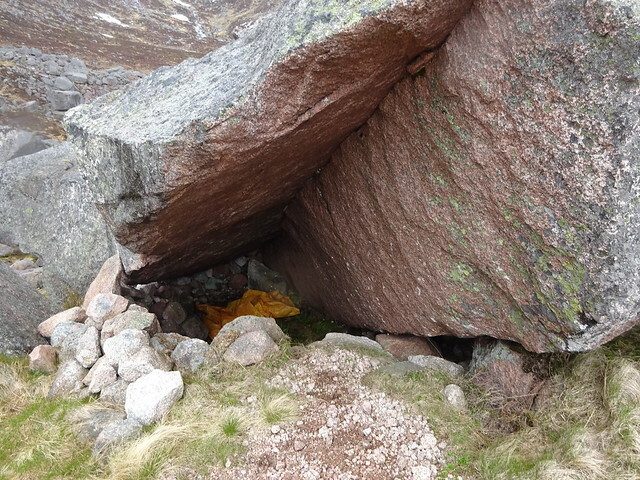 Once emerging from Coire Raibert the wind was back with a vengeance. 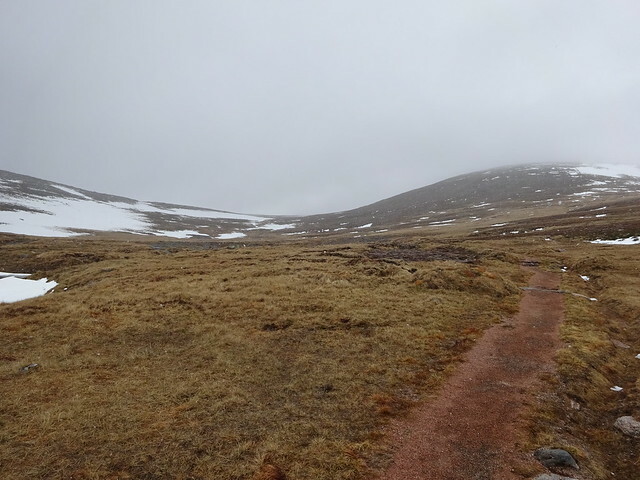 I battled through it to investigate a descent down Fiacaill a’ Choire Chais. This looked very steep and there was still snow on the crest. The weather had perked up considerably! 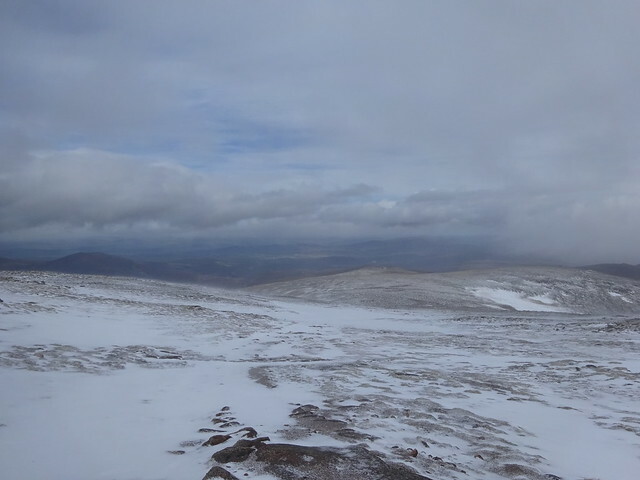 I headed back up Cairn Gorm again where another snow shower was nearing. 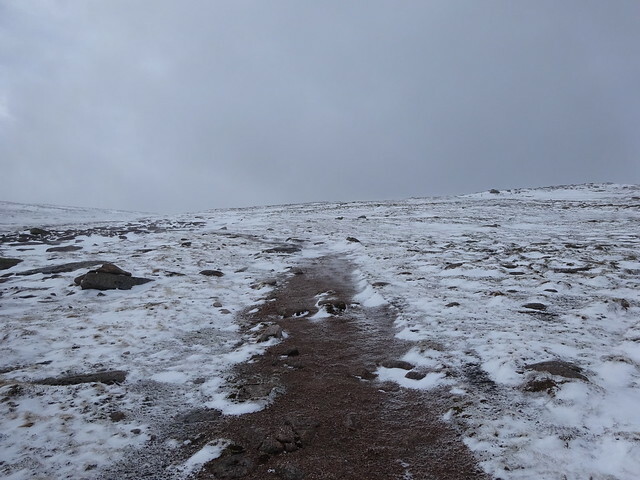 I followed the cairns downhill and on route had a chat about the conditions with a guide who was taking two walkers up Cairn Gorm. It was his third trip today. We both wondered whether the wind was now slowly building up to the forecasted 80mph. It was certainly fierce! The snow covered ‘cobbled street’ leading down to the restaurant made for an unpleasant and slippery descent, but at least there was no chance of going astray in the now poor visibility. The walk down Windy Ridge was done in blazing sunshine but it cost a lot of effort to stay upright. Wind battered I arrived back at the car park. It had been a most satisfying day nonetheless. Enjoyed reading that..... but was it really in June? Sounds more like January! Thanks dogplodder! June is supposed to be one of the better months for walking in Scotland. But this year October seemed to be new June. Always good when the scenery is drawing you further and further on. Thanks litljortindan! That's exactly what makes a great walk for me.